The first Great Dane I came across belonged to my grandparents, her name was Tessa, even at the tender age of 6 I knew she was a gentle soul, wrapped in a brindle coat. All my free time was spent with Tessa, exploring the garden, building tents out of sheets, sharing secrets and snuggling on the couch. Tessa established my love for the breed which continues to grow. 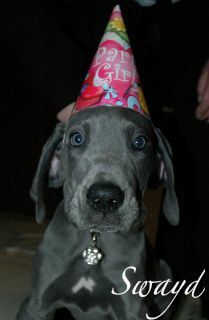 The first Great Dane I have the pleasure of owning was my beautiful black girl Sway. With Sway I learn't about the finer points of the breed standard, how to present and exhibit a Great Dane and then under the guidance of my then breed mentor Gayle Revill from Thunderfire Great Danes, had my first litter. The prefix Swayd is in honour of Sway, she has taught me many valuable things about the breed I so admire. I am very active in the dog world, most weekends you will find me at a dog show somewhere in Australia. I have shown my Danes in Victoria, New South Wales, South Australia even in Tasmania! I was the Vice President of The Great Dane Club Of Victoria for 4 years, and have been the President for the last 2 years. I am a current Member of Dogs Victoria & Dogs New South Wales, Member of the Great Dane Club Of Victoria & NSW as well as several overseas Great Dane Clubs, not to forget a member of a number of All Breeds Kennel clubs. I promote this wonderful breed at any chance, as well as raise funds for rescue and trophies for our shows. I regularly attend lectures on health issues, reproduction and breed lectures, I'm also an authorised DNA collector. Smokey has recently become an accredited Therapy Dog with Dogs Victoria, we look forward to visiting some hospitals in the near future. I eagerly await the next testing night so that Sway can try out for her Therapy Dog licence. Update! Sway is now a certified therapy dog with the VCA/Dogs Victoria!! To this day I continue to learn, exhibit and most of all love the breed I share my life and home with. I breed for type, health and temperament first and foremost - pet or show dog. My dogs are raised in my home "free range" as I like to call it, I don't have kennels.